Transformers Watches Are A Modern Tribute To Kronoforms | OhGizmo! 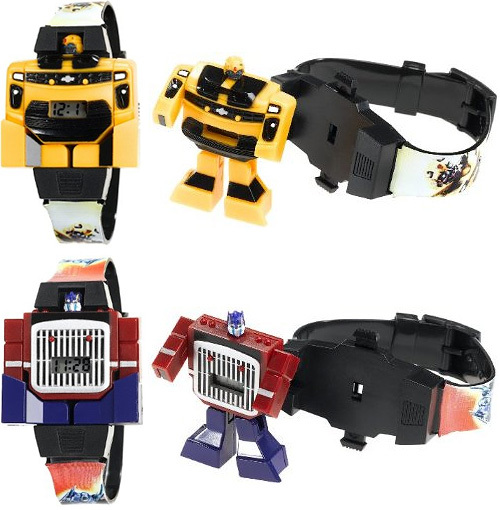 In terms of transformability, these new Transformers watches aren’t that far off from the Kronoforms that helped make the 80’s as awesome as they were. But I don’t think today’s kids will even give them a second look since all they’re really getting is a basic robot toy and an even more basic LCD clock. No sound effects, no rocket launchers, no LEDs and no websites to interact with. Yeesh! When I was a kid we didn’t have… well you know how it goes. $9.99 each available from Amazon. And I thought they couldn't come up with another cheap yet crappy watch. Boy is my face red. Only adults will appreciate it, but only a few are …. to wear them. I guess they transform, but they don't transform very much, or very well. It feels like these are 15+ years too late. It could just be that I am out of what I'm guessing is the target demographic of people younger than me.